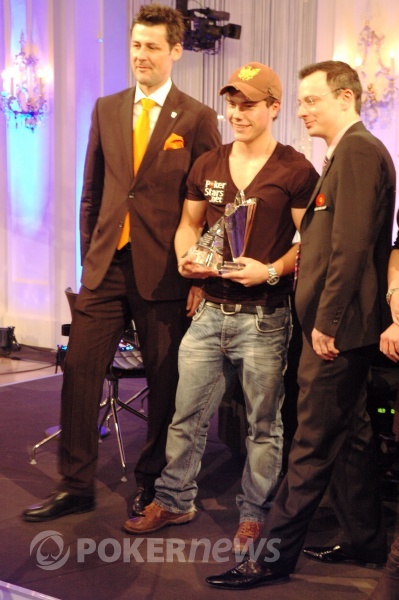 Michael Eiler Wins 2010 PokerStars.net EPT Vienna (€700,000)! "WOOOOOOOOOO!!!" cried Michael Eiler as he lifted the coveted trophy just now. And we can imagine that this is a wonderful moment for the 20 year old economics student. He's won the Sunday Million before on PokerStars where he plays under the screen name "mae9690" but this win here at EPT Vienna has catapulted him onto the brick and mortar circuit, shown his calmly competent play live on TV to poker enthusiasts all over Europe, and handed him €700,000! A grinning Eiler was presented with a small version of the huge silver EPT trophy, as well as a glass pyramid courtesy of the Concord Card Casino. Banks of photographers, as well as a small group of his supporters, gathered around him as he began what will probably be a Halloween of celebration. 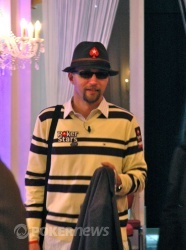 He hugged runner-up Martin Hruby after the final race was won, and would be the first to admit that the final table did not always look to be his oyster. Stuck around the 2.5 million mark for much of the day, Eiler outlasted start-of-day favourite Daniel Negreanu and super-stacked Konstantinos Nanos to get to the point where he was heads up with the Czech Team PokerStars Pro. Level-headed even when the deck seemed unfavourable (several times earlier in the tournament he was three-outed by all-in opponents), Eiler faced several setbacks along the way to victory but always seemed to recover effortlessly. The young German player started play today by jumping straight into the action and he was there as it concluded. Congratulations to Michael Eiler, and thanks to PokerStars, the Kursalon and Concord Card Casino for making this event such an exciting and seamlessly run new addition to the EPT circuit. The biggest prize pool ever in Austria has been awarded, the TV table is empty and it just remains to say: Good Night Vienna! For the third time in a row we heard Michael Eiler announce, "I'm all in," from the button. There's something about these magical words delivered in a German accent that is particularly thrilling for some reason. But the cameras now moved back to Martin Hruby, who considered his options. He looked at Eiler, and then back at his stack. And then he said, "Call." Boards do not get more decisive than that. 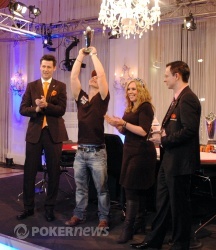 The Team PokerStars Pro will have to settle for second place, because the trophy is going to Michael Eiler. Michael Eiler has extended his chip lead, moving all in every few hands in between swapping some cagey blinds with Martin Hruby. The first real dent in Hruby's 5 million appeared when Eiler threebet shoved on him from the big blind (picking up 650k), and overall Eiler is coming out ahead in their preflop confrontations. No flops at the moment. The last two hands of the level were button raises and their accompanying big blind folds. One all. They enter this latest break in almost exactly the opposite chip positions they started the heads up part of the final table! Michael Eiler opened for a now standard 425,000 from the button and Martin Hruby called to see a flop; they both checked and the dealer out the on the board for them as well. Hruby checked again and this time Eiler bet 525,000. Hruby was undeterred, and made the call. The river was the and Hruby checked a third time. This time he found himself facing a 1.225 million bet. He considered it for a minute or two before making the call, and then promptly mucked to Eiler's for a rather slow-played top pair. Eiler now has a pretty hefty chip lead, 11.9 million to Hruby's 5.67 million.